Location was good and walkable to sights. Room was clean and the hostess, Paula was super sweet and helpful in every way possible. We were packed and ready to leave after our first night's stay due to the room being nothing like we had booked or expected (it was in the basement!!!) but she moved us to another room, assisted us with maps and directions, and was very knowledgeable of the area. Washing machine in unit was nice, and great to be able to get coffee supplies at the office. Many restaurants, coffee shops and even a flamenco theatre very close to hotel. Excellent size rooms with full kitchen! The check in was SUPER easy. The hotel is within walking distance of many groceries, restaurants and plaza España which is the pick up and drop off for most major tours. Everything!! The Room was super clean, well designed and super spacious. The hotel facility and in-room amenities were generously offered and well thought of. Definitely will stay here again. Good location, close to central street. Well stuffed kitchen with cutlery, plates, cups, etc. The property was centrally located, with local sites, restaurants and grocery within easy walking distance. The apartment was clean, and very good for families. Staff was accommodating and incredibly helpful. I would recommend staying here again. The apartment was spacious, nice and functional, the location is great, and the staff was very helpful and friendly. Good value for money. good location, near public transpo (1 ride away to the main train station, theres is a direct bus towards Santiago Bernabeu), lots of local shops around the area. Its a huge apartment, a family of 5 fits perfectly with still a lot of room to go around with. 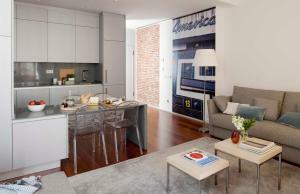 The apartment was centrally located, clean and the floor plan met our needs perfectly. 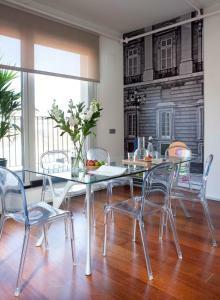 Lock in a great price for Eric Vökel Boutique Apartments - Madrid Suites – rated 9.1 by recent guests! One of our best sellers in Madrid! Only 1,950 feet from Plaza de España Square, these bright and modern apartments with city views include free WiFi. A 24-hour check-in and check-out facility is also available. 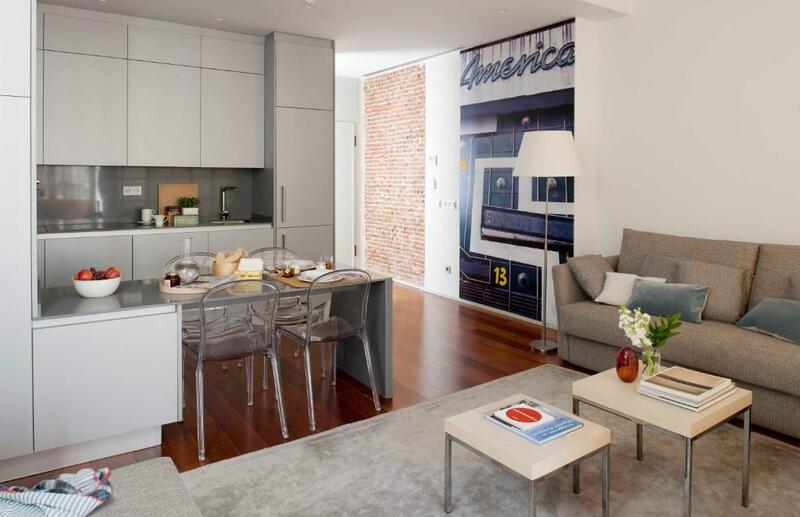 All apartments at Eric Vökel Madrid Suites feature exclusive designer furniture. Some apartments have a balcony and terrace. Each apartment is equipped with a flat-screen satellite TV including a USB connection port for iPods and cameras. Guests will find plenty of shops, bars and restaurants on and around Calle San Bernardo Street. Plaza del Sol and the historic center of Madrid is about 15 minutes’ walk away. Noviciado Metro Station is just 350 feet away. 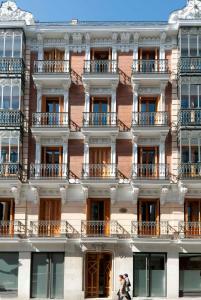 There is a tour desk at Madrid Suites, as well as a concierge and car rental service. 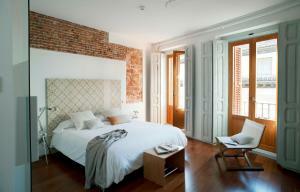 뀐 Located in the real heart of Madrid, this property has an excellent location score of 9.2! When would you like to stay at Eric Vökel Boutique Apartments - Madrid Suites? This elegant apartment with contemporary furnishings has a small balcony, 2 double bedrooms and a bathroom with a shower. It includes a living-dining area with a sofa bed and kitchenette. This elegant apartment has 2 double rooms and 2 bathrooms, one is a en suite. There is a spacious living/dining room with a double sofa-bed and giving access to a fully equipped kitchen. Available in one floor or in Duplex. This elegant apartment with contemporary furnishings has a large terrace with city views. It includes a twin and a large double bedroom, a modern bathroom with shower and a spacious living-dining room with a sofa bed and kitchenette. This elegant apartment with contemporary furnishings has 3 terraces, 3 large bedrooms and 2 bathrooms. It includes a spacious living-dining room with a sofa bed and a separate, full kitchen. Featuring contemporary furnishings, this duplex apartment has 2 double bedrooms, 1 twin bedroom and 2 bathrooms. The open-plan kitchen is equipped with a microwave, toaster and dishwasher, while the living area comes with a sofa, flat-screen TV and dining table. Born in Copenhagen, his life is architecture and design. Devoted collaborator with important Nordic designer studios, it was while he was on one of his many trips that he arrived in Barcelona; its architecture, culture and Mediterranean liveliness grabbed him. The impact this city had on him was so strong that he decided to stay and bring to life his latest project: Eric Vökel Boutique Apartments. Each of the apartments has been designed and decorated by Eric, delivering an unparalleled style that mixes Nordic design with a mediterranean soul. 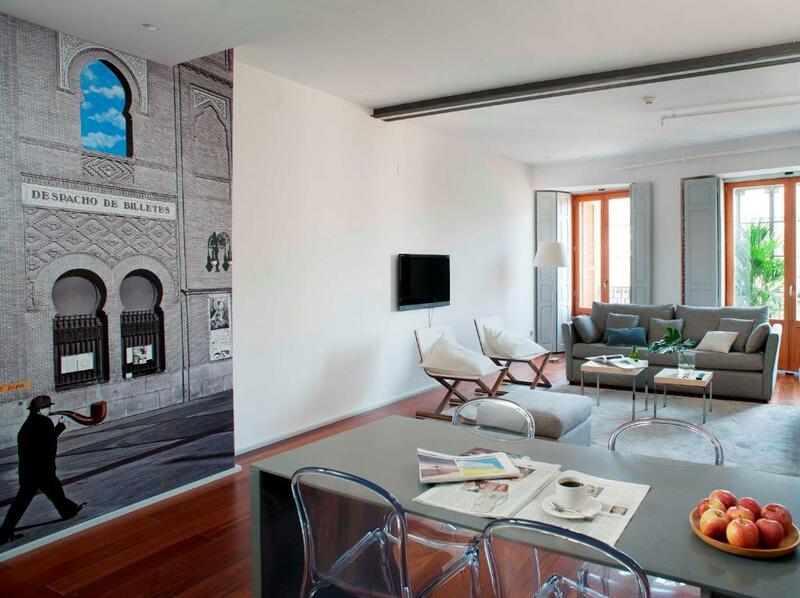 Safeguarded by its historical value, Eric Vökel Madrid Suites is a gorgeous and incredibly refurbished property which includes beautiful apartments. 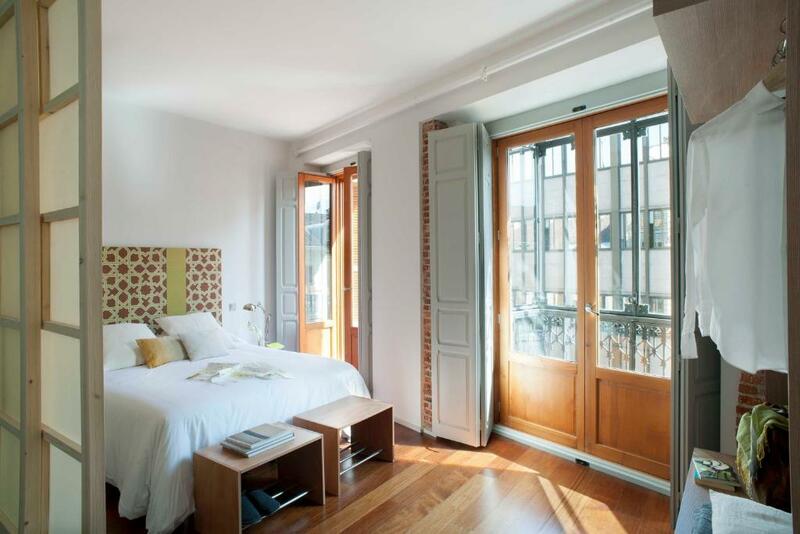 Located in the heart of the Malasaña district, next to the Gran Vía, it allows guests to experience and enjoy a more pure, authentic Madrid. 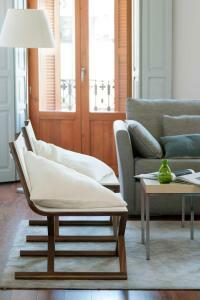 House Rules Eric Vökel Boutique Apartments - Madrid Suites takes special requests – add in the next step! Eric Vökel Boutique Apartments - Madrid Suites accepts these cards and reserves the right to temporarily hold an amount prior to arrival. Reception opening hours are from 09:00 to 18:00. If you arrive outside reception opening hours, you can contact Eric Vökel to receive the instructions of the automatic check in. Cash payments are not accepted with the check-in machine. If you arrive before your apartment is ready, you can leave your suitcases in the luggage storage room. Bed linens and towels are included. For stays of 4 nights or more, there is a cleaning service every 4 days. Additional cleaning services can be booked at an extra cost. Please note a tour desk and concierge services are available at Madrid Suites. Please note that children up to 3 years stay for free in existing beds. Older children are considered as adults. When booking 3 or more rooms, different policies and additional supplements may apply. 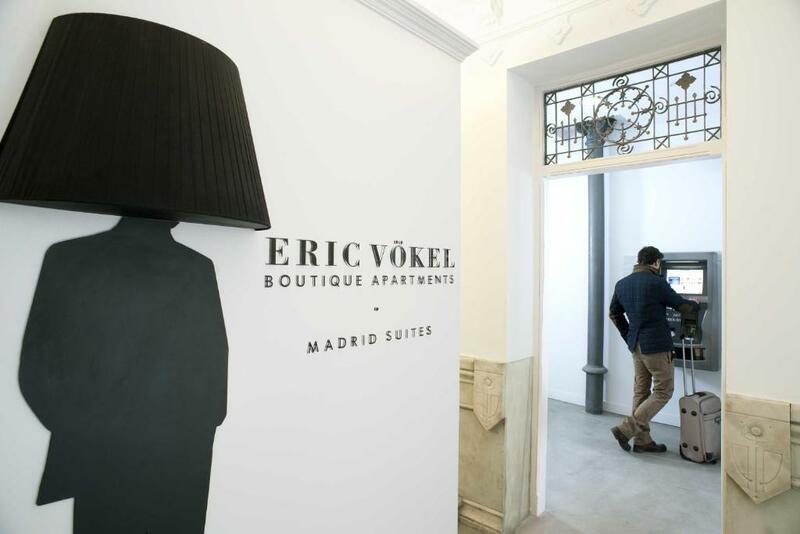 Please inform Eric Vökel Boutique Apartments - Madrid Suites of your expected arrival time in advance. You can use the Special Requests box when booking, or contact the property directly using the contact details in your confirmation. The first nite was a nightmare with check in afterhours very difficult and the room was totally unacceptable in the basement. Obviously no one to remedy the situation until after 9 am the next day. We had confirmation of a 2 bedroom apt. with balcony, and this certainly was not it!!! The apt. was in the basement below street level and one bedroom was almost a miniature not made to accommodate 2 adults. Location was extremely noisy from street noise (vehicles, garbage trucks, sirens, drunks) and even the hotel itself was noisy at night due to young drinkers and party type people. There should be a security guard or night clerk to prevent these annoyances. It’s REALLy loud all the time. It was very hard to sleep since you can hear everything outside. I highly recommend you bring earplugs and fans to drown out the constant city noise. We booked 2 apartments (both penthouses level 4) as we were travelling with another family and their grown up children. In total there were 9 of us and we all really liked the apartments. They were light, clean, decorated in a contemporary style and well equipped. We booked in during office hours and it was really straightforward. The staff were informative and helpful and coffee, tea etc was available for use in your apartments. They were also happy to arrange taxis and store luggage for early arrivals or late departures. The location is perfect for exploring Madrid and we walked everywhere without needing to use public transport. There is a fantastic place for breakfast/ brunch just a 5 minute walk away called Cafe Federal - lots of delicious healthy options too (it is very popular so you may have to queue at busy times). 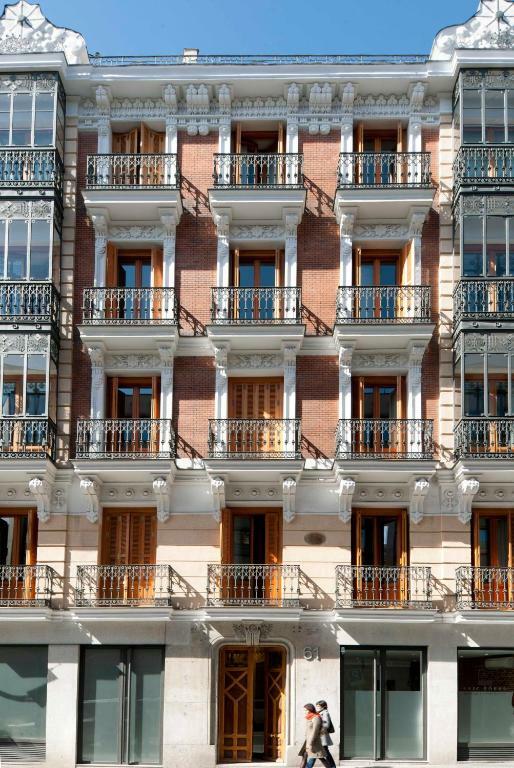 Madrid is a lovely city and these apartments are a perfect base to explore it from. The only small negative is that as the area is very central there is a bit of noise at night, it didn't bother us but you might want to bring your ear plugs if you are a light sleeper. Beautifully designed flat, spacious and clean; friendly staff, good location. We couldn't figure out how to use the microwave! And we didn't find the 2nd mirror until the 2nd day - there is one in the bathroom, and then one on the inside of a door in the hallway. Excellent location. Nice minimalist decor inside the apartment. Enough space for our family to move about comfortably. Nice bathroom - good size and strong water pressure in the shower. Lovely view onto San Bernardo street. Friendly, helpful staff. We came in after 6 PM and the lovely lady who was already closing reception still did the checkin for us. Very spacious apartment and lockers when you check out to leave your bags. Nice hotel apartment with good level of appliances, well located. Good for families Reception people are nice. A full length mirror is required, us girls like to see head to toe as we get ready. Perfect property, fitted well equipped kitchen, dishwasher, washer/dryer (detergent supplied) coffee machine. Great size rooms, fantastic verandas! Ivan at reception was so helpful with everything we asked for. We stayed in the 3 bedroom penthouse, it was close to the metro and within 30 metro ride to all sights. We never had to take a taxi anywhere! We were so close to loads of bar and clubs .